1 of 2 Combine chicken, vegetables, carrots, broth and 6 tablespoons of the teriyaki sauce in slow cooker. Cover; cook on HIGH for 2 1/2 hours or on LOW for 5 hours. 2 of 2 Stir together remaining 2 tablespoons teriyaki sauce with cornstarch. 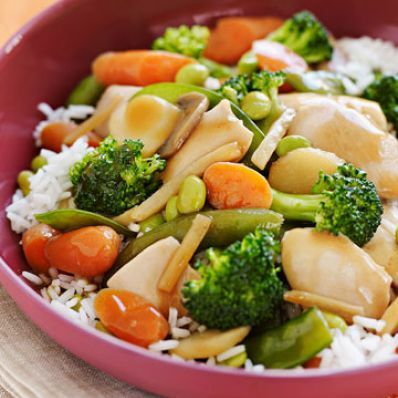 Stir teriyaki mixture into slow cooker along with broccoli and cook an additional 30 minutes or until sauce has thickened. Serve over white rice, if desired.